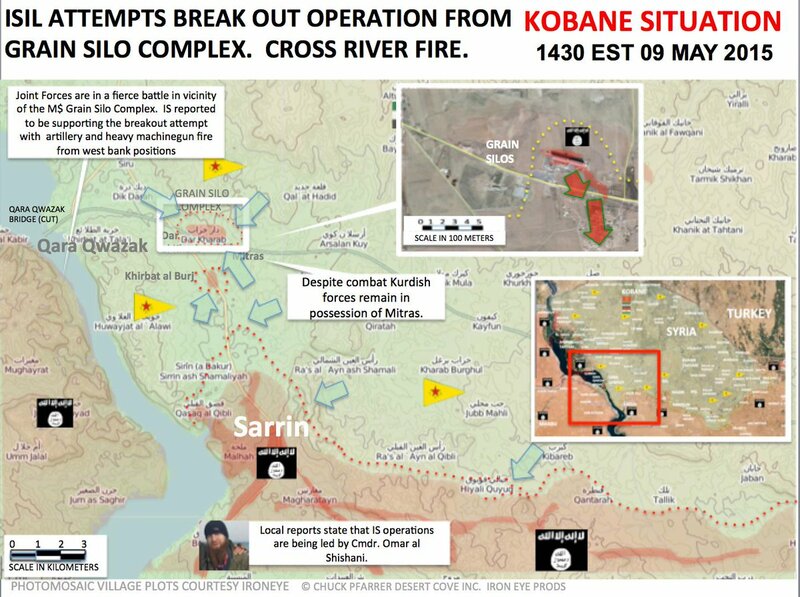 Following nearly two months of an stalled earlier offensive, YPG-led fighters renewed offensive operations on Sarrin on 18 June 2015, followed by a full-fledged operation on 1 July, after ISIL's Kobanî massacre. On 4 July, the town of Sarrin was fully besieged by YPG and FSA forces, as well as the village of Khirbat al-Burj and the Sarrin Grain Silos, both located north of Sarrin. 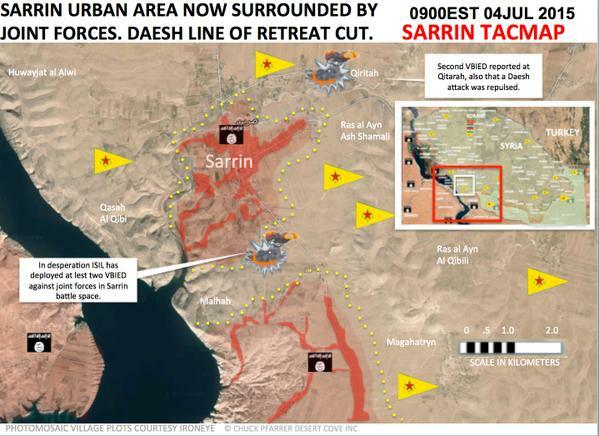 On 12 July, ISIL forces managed to break the sieges and reestablish a supply line to Sarrin, after receiving reinforcements. However, on July 24, YPG and Free Syrian Army forces reestablished the siege of Sarrin, with the sieges of the Sarrin Grain Silos and Khirbat al-Burj being fully re-established by the next day. 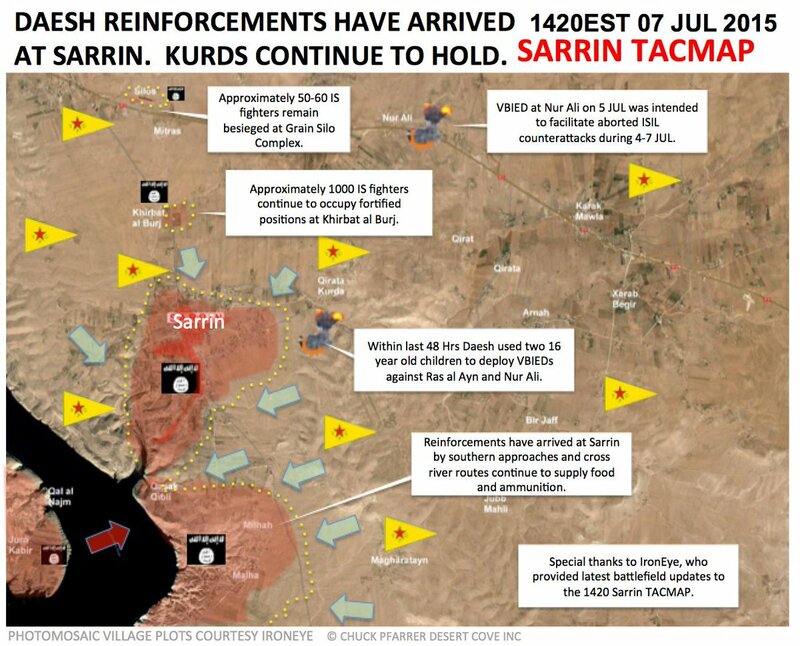 On 27 July, YPG-led forces fully captured Sarrin and the surrounding region, including 25 surrounding villages and 20+ farmlands, and the YPG declared the end of their offensive. 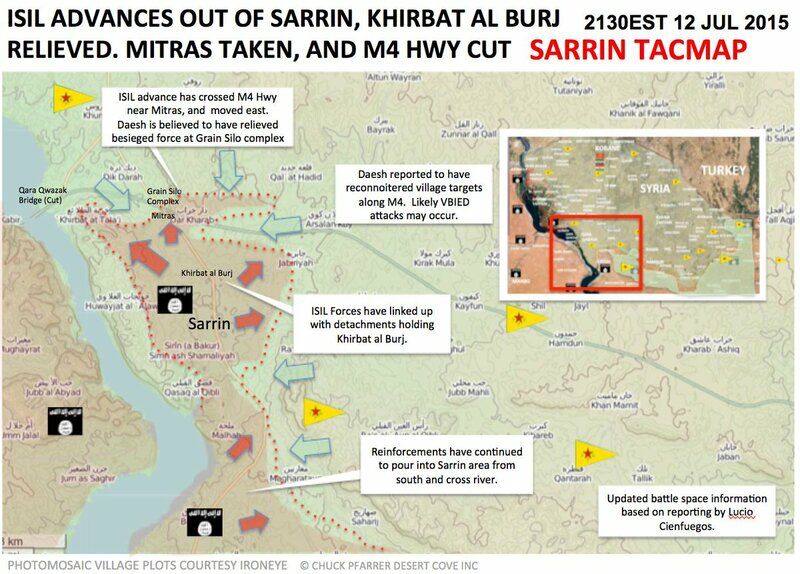 On 25 July, YPG-led forces captured most of the villages around Sarrin, re-establishing the siege of Khirbat al-Burj, to the north of Sarrin, as well as fully securing the northern approaches to Sarrin. Meanwhile, ISIL forces in the besieged Sarrin Grain Silos continued to hold out. YPG-led forces were also reported to have stormed the town of Sarrin, entering the eastern neighborhoods of the town. On the same day, ISIL attempted to launched another wave of vehicle bomb attacks to stop the YPG and FSA advance; however, the YPG-led forces reportedly destroyed the vehicles before ISIL was ready, killing 7 ISIL militants. ISIL also attacked the villages of Shuikh and Qara Qozak, but YPG-led fighters repelled these attacks as well, killing at least 1 ISIL fighter. ↑ 16.0 16.1 16.2 Daesh Reinforcements Have Arrived At Sarrin. Kurds Continue To Hold. ↑ 19.0 19.1 Sarrin Urban Area Now Surrounded By Joint Forces. Daesh Line of Retreat Cut. ↑ ISIL Driven From Key Hill Tops And Villages Near Sarrin. Offensive Begins. This page was last modified on 25 February 2016, at 20:24.